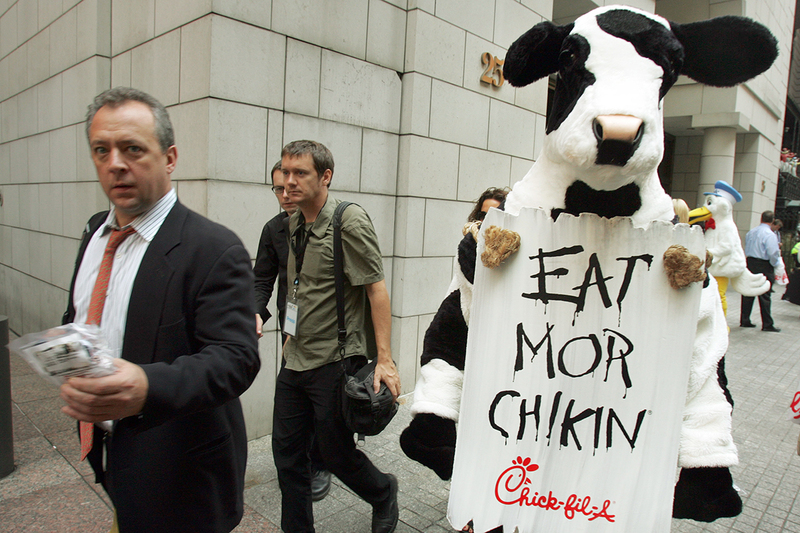 Should You Dress as a Cow for Chick-fil-A’s Cow Appreciation Day? Love Chick-fil-A? Then don’t miss your chance to snag your favorite dish on Cow Appreciation Day — for free. Mark your calendar to show your appreciation for cows (and chicken sandwiches) on Tuesday, July 10. Stores will celebrate from open until 7 p.m., and a full cow costume is not required. Fun fact: Chick-fil-A launched its cow campaign in 1995, featuring billboards with three-dimensional cows holding now-iconic “Eat Mor Chikin” signs. Gone is any pretense that you have to go horn-to-hoof on the cow theme to get rewarded. Basically, wear “any sort of cow apparel” to receive a free entree. It’s good for the breakfast and lunch menus, depending on when you arrive. Your little ones can also get a kid’s meal for their efforts. Salads are no longer offered as a free entree option in a move to simplify the experience, according to the company. Of course, you can’t go wrong with the Chick-fil-A classic chicken sandwich. This annual event used to require donning an entire cow costume in exchange for a full free meal. Managers could, at their discretion, reward patrons partially dressed as cows (think hats and headbands) with free entrees. But now, it’s a little simpler to earn your free food. Even though you don’t need to be fully dressed as a cow, you might be tempted to order a cow costume just for the occasion. But it’ll take you a few years of Cow Appreciation Day visits to earn enough free sandwiches to pay for the costume — unless you’re anticipating some serious time on the Halloween party circuit. What’s a freebie-loving, party (farm) animal to do? We made this handy flowchart to make your dress-up decision a little easier this year. Lisa Rowan is a writer and producer at The Penny Hoarder. She hates waiting in line.